Big Sky Basketball: What Impact Will Frank Otis Have On Weber State? 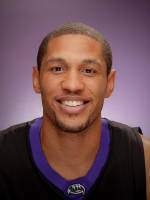 One of the biggest transfers into the Conference that is eligible to play this year is Frank Otis for Weber State. Otis transferred from SMU, and eligiblity-wise will be a junior. He played two seasons for SMU. As a freshman, he averaged 2.4 PPG and 2.2 RPG in 13.9 minutes. As a sophomore, he averaged 2.1 PPG and 3.1 RPG in 11.0 minutes. As a sophomore in his role he posted very solid rebound rates, and shot 55% from the field (albeit on 42 FGA). Otis is a 6'6'' F who is primarily a low post player, which is important because that is probably the area where Weber State is the weakest. While Otis probably won't start this year, he will definitely be in the rotation. In addition, with the graduation of Kyle Bullinger and Darin Mahoney after this season, Otis looks likely to be a starter next year (obviously a lot of things could happen between now and then). Weber State (and Big Sky) fans, what do you expect from Otis? Will he be a significant contributor this season?